Have you ever wondered hom much, if anything, you are giving up by using fairleads instead of blocks? How much friction is there. How does this compare with a block? Does the style of the fairlead matter? This article attempts to answer these questions. I first started taking measurements with a simple luggage scale picked up at the local Restoration hardware similar to this one. Shown at the left. After it exploded due to the pull I had to put on it to lift 40 pounds after the friction increased it to near 70 pounds I bought the one on the right. This scale reads up to over 200 pounds in 1/2 pound increments. Using this scale, I was able to compare the force required to move the 40 pound weight against without the fairlead to the force required to move the weight when there was a bend through one of two types of fairleads. I took data at many angles with both fairleads. I also took some data with different line types, specifically Samson XLS and Amsteel. The test bench is shown above. It had a 40 pound weight hung over a low friction Garhauer block. 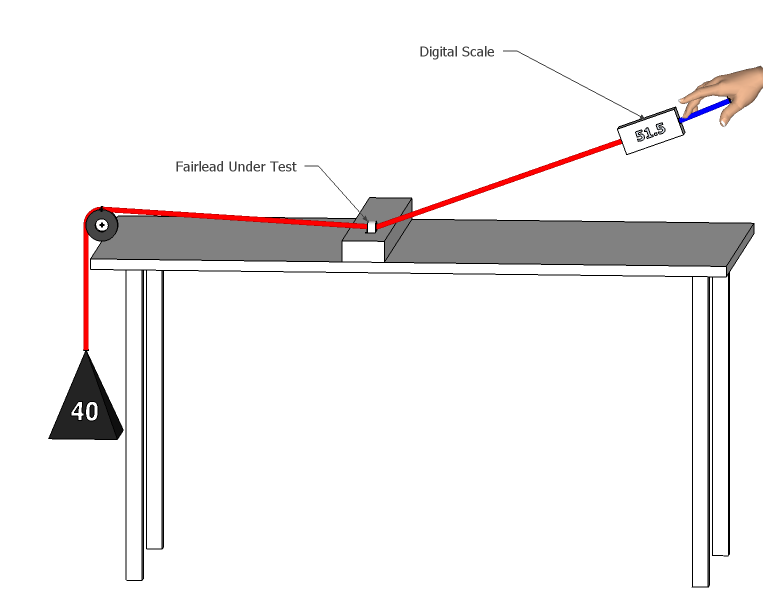 The test fairlead was mounted in the center of the table and the digital scale provided the force reading. The height of the line at one foot from the fairlead provided the indication of the angle of pull. Of course, 90 degree and 180 degree numbers were obtained with just eye-balling the pull angle. I also did points using a 30-60-90 triangle to align the line. There was some scatter in the measurements but fitting a trend line through the data gave a reasonably good fit and clearly showed the difference between the two fairleads. The Ronstan RF59 shown at left is a 9/16" ID steel fairlead with a steel insert. It is Nylon with a SS insert and has no specified working load. 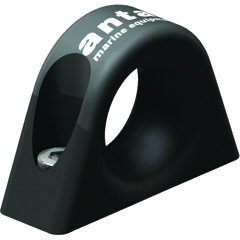 The Antal 20x20 "deck ring" is an aluminum fairlead with a very smooth rounded cross section. It comes with two socket head mounting machine screws and is, imho, a piece of art. It has a SWL of 1700 pounds which exceeds the SWL of anything I am going to put through it. It is, however, four times the price of the Ronstan. There really is no reason to think that the friction is anything but linear with deflection. To be non-linear, something would have to deform permanently or a new mechanism would have to come into play. 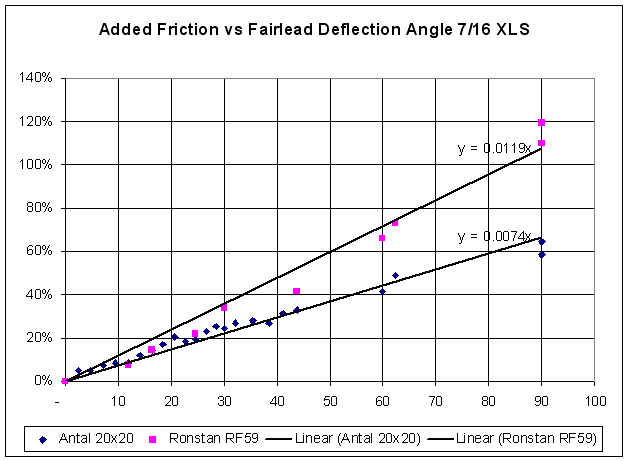 The results show that the much smoother Antal fairlead has less friction than the steel lined Ronstan fairlead. The take away numbers are that the Antal has about 0.7% additional friction per degree of deflection. The Ronstan has just over 1% of added friction per degree of deflection. 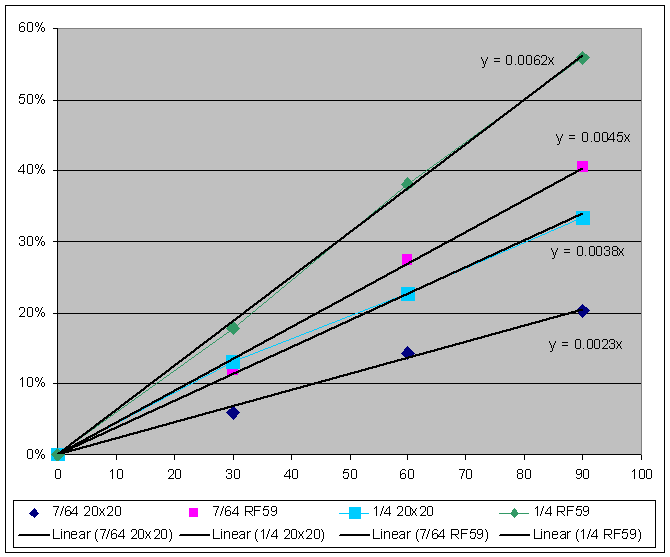 I would certainly say that for low deflections the $6 Ronstan RF59 might be the better choice compared to the $25 Antal 20x20. But if money is no object, the Antal is in a class of its own. We learned things we probably already knew. 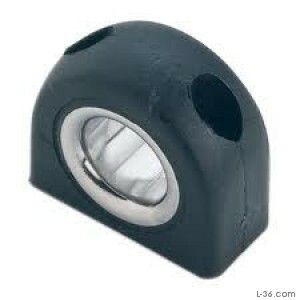 A good fairlead is going to have a smooth gently rounded surface rather than a flat one with abrupt corners. We also learned that the loss due to friction is small for small deflections and increases linearly with deflection. Finally, we learned that with XLS the loss is around 1% per degree of deflection. Thus for a few degrees of deflection a fairlead is a fine solution. For an extreme bend, say 90 degrees, a block would be better. What we want to learn with this further testing is how does Amsteel compare to traditional double braid (XLS). Also, by testing different diameters, we can see how the diameter influences the results. For this test I will use 7/64 Amsteel and 1/4 inch Amsteel. Again I used both the Antal 20x20 and the Ronstan RF59. The smaller Amsteel gave the lowest friction and the Antal 20x20 outperformed the Ronstan RF59. All of these combinations had lower friction than the 7/16 XLS due to the smaller size and the slippery material. The friction from the smallest line and the Antal Fairlead was just 1/4% per degree. That went up to 3/8% per degree for the 1/4 inch Amsteel. Switching to the not as fair Ronstan fairlead raised those numbers to 7/16% and 5/8% respectively per degree. Again, we learned things we probably already knew. Amsteel is lower friction than Double Braid and small diameters are lower friction than larger ones. I did not test it here, but larger diameter curves in the fairleads but smooth radius, would be lower friction than smaller diameters as it is very likely that it is the rato of line diameter to ring diameter that is important. The next article in this series will cover low friction rings. Included in the test will be Antal low friction rings, REI descender rings, and standard stainless steel rings.